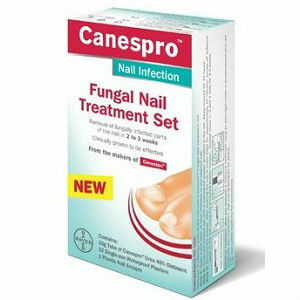 Canespro is a product sold by Bayer which treats and cures nail fungus, especially on toenails. It comes in an easy-application tube and claims to show results within 2-3 weeks. But is Canespro all talk? Canespro works with an ingredient called Urea, which is a chemical frequently used as a nail softener. Urea has been clinically proven to produce fast results in the treatment of nail fungus, and it is a very safe substance for topical use. Because of its nail-softening properties, Canespro is able to work more quickly than most other treatments. Canespro should be applied directly to the nail once to twice daily for 2-4 weeks. After this, follow-up treatment is recommended to ensure fungus does not return. Because Canespro is applied topically to the nail, the risk of side effects are minimal and include slight skin irritation, reddening, softening, peeling, localized rash, hives, blisters, burning around the nail, contact skin dermatitis, nail disorders, and nail discoloration. Parents should speak to a doctor before giving it to children and should discontinue use if side effects arise. Canespro can be bought from UK vendors for about 35.20 Euro. Because it is only available in European markets, it is difficult to obtain for American citizens and also more expensive than other treatment options. Canespro works more quickly than most other fungal treatments which generally take 2-3 months to produce long-term results. It has also gone through clinical tests and is proven to work. User testimonials are also available that indicate Canespro’s effectiveness. However, because of the difficulty that Americans experience obtaining the medicine, it is not the most affordable option. For quick results, though, Canespro is a good product. Jack Stevens	reviewed Canespro	on August 5th	 and gave it a rating of 4.